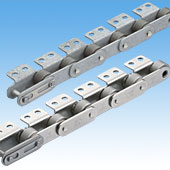 A Lambda Double Pitch Chain that is surface treated for better corrosion resistance. We offer NP and NEP Series to meet your corrosion resistance needs. Plates and rollers are nickel plated for light corrosion resistance. Features a special triple surface coating on the plates and a special coating on the rollers for increased corrosion resistance. NEP Series chain is made to order. Contact a Tsubaki representative for details.